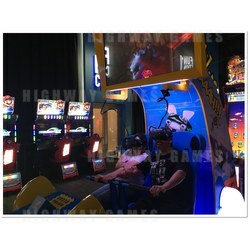 Virtual Rabbids by LAI games and in conjunction with Ubisoft, is the first VR ride for Arcades and FEC that is Attendant Free. It works through coin or bills. Players can travel to three different experiences and uses the HTC vive headset with motorized movable seats. The three unique experiences are Alpine Adventure, Canyon Chaos and Holiday Hinjinks which all make use of the D-Box motion base and wind simulation included in the cabinet. There is a video (link below) on the website of various people trying it out and it seems like a blast. The video and the website sadly does not give us a release date but it has been testing in various locations.